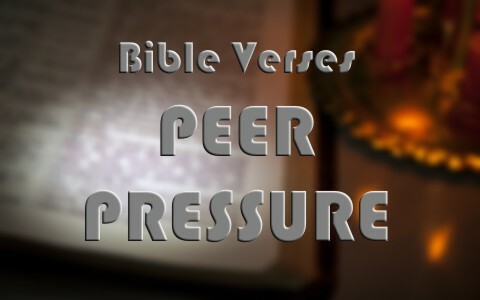 Here are seven Bible verses that relate to peer pressure and how to avoid it. The word for “conformed” as used in the command to not be conformed to this world could better be rendered, “do not let the world squeeze you into its form” so we are told to not let the world conform us or shape us but rather, be transformed by a renewing of the mind and this is important so we can “discern what is the will of God” and what’s “good and acceptable and perfect” for us. It’s not our peers who should mold us into their image but be molded or shaped into the image of an obedient follower of Christ. We know that whoever we associate with we tend to become like and if we’re associating ourselves with Christ, we’ll become wise. We know that wisdom tends to rub off so why not walk or associate with those who are wise, meaning biblically wise. The only other choice is to suffer harm from being the companion of fools (or those who don’t have the Spirit of God). To walk with someone means you are in agreement with them just as the Prophet Amos wrote, “Do two walk together, unless they have agreed to meet” (Amos 3:3). If you are walking with ungodly people then you are saying you are in agreement with them. I mean by “walking with the ungodly” that you are going where they are going, doing what they are doing, and thinking what they are thinking. The godly should not walk “in the counsel of the wicked” and not stand “in the way of sinners” and sit with the scoffers, probably meaning those who scoff at God. As I mentioned in the previous paragraphs, you can become like those you associate with. Your peers may put pressure on you to do things you normally wouldn’t do so don’t be deceived; “Bad company ruins good morals” and that doesn’t mean everyone but us. We can be deceived into thinking we’re being salt and light for the lost but by being continually in their company, we’re going to do things that they do and clearly, the ungodly won’t be living lives that are pleasing to God. Peers can easily persuade us into doing things we know that are wrong. When everyone else around them is living in sin, they can easily become ensnared in it. We can’t let sinners entice us into doing things that are contrary to God’s law. It’s so easy to do if we continue to listen to sinners and more so when we walk with them. Obviously, this wasn’t written about peer pressure but the Apostle Peter’s point is well taken that we should obey God not man, especially those who are not saved because they don’t have the Spirit of God and cannot, by nature, do the things that are pleasing to Him. We are supposed to obey God and not be enticed or influenced to sin and obey the sinful nature of mankind. Pontius Pilate didn’t really want Jesus crucified because He declared the Man, Jesus Christ, innocent (Luke 23:4) and “he knew that it was out of envy that they had delivered him up” (Matt 27:18). Tragically, Pilate declared Jesus innocent and found no fault in Him but allowed the pressure of the Jewish crowd to influence him and so, “wishing to satisfy the crowd, released for them Barabbas, and having scourged Jesus, he delivered him to be crucified.” He was more interested in pleasing men than following his own conscience and now, he is regretting this for all time. We don’t have to be a teenager to be influenced by peer pressure. We are very much like sheep…we follow whoever is in the lead or follow where the rest of the sheep go but the truth is, sheep without the Good Shepherd, are headed for a slaughter. Jesus said that His sheep hear His voice and the sheep know His name and they will not follow another (John 10:27). The broad path is where most of the lost sheep are headed…and they are headed for God’s judgment. If only they will hear His voice while it is still today (2nd Cor 6:2), they won’t have to perish someday for muting His voice and suppressing the knowledge of God as they’ll be without excuse (Rom 1:18-20). Thank you so much for this, and thank you for analyzing them. I still come to this website once in a while, and these articles help me a lot! Thanks always for the good articles. This website and the articles here really help me a lot. Previous post: Why Did Jacob Wrestle With God In The Bible? Next post: Conviction Versus Preference: What’s the Difference?